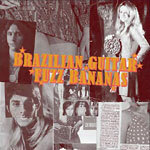 Brasilian Guitar Fuzz Bananas should serve as a master class for those entranced by the funky, heavy psychedelic wonders of the Tropicalia movement and all that it spawned. Some of the rarest and best examples of fuzzy, funky Brazilian psychedelia, originally released on promo-only 7-inch records from 1967 to 1976. Each song contained on this album has never been reissued, and has been restored from the best source possible and remastered for near-perfect sound quality. Gatefold jacket includes detailed liner notes with a wealth of imagery and detailed histories in both English and Portuguese. Free 3D glasses included!